I want to have a big update for RealCADD v5.00. Already the mouse position pallet will be modified as George request. And I want more possibility for the arrows. I think adding square or rectangle "arrows", diamonds and circles could be change to ellipses. I can (inevitably ) think of a few things. Add dimensioning tool for Radius and Diameter. It would be nice if you could select to have R or D (or maybe Ø as well – or your choice of symbol) - or just the plain dimension. Dedicated entry for Nudge amount (just a small box bottom left with the others?) Very simple direct entry. Text still jumps about when you want to edit it - not as bad as it was at all, but still not easy, specially with tables and columns of text. It would be great if this could be further improved. Improve formatting: specifically to be able to make one or more words in a block of text Bold and/or Underline, without the whole of the text block changing. Make text a resizable object. So if you type a block of text and find that you want to change the width, you can do so by dragging one of its handles, just like any other object. So if, for example, you drag a block of text to be narrower, the overflow just flows on to another line. New lines (returns) and paragraphs (double returns) are respected. At the moment if your initial text entry was, say too wide, to make it narrower, you have to put in returns, take out old returns to move some text up, then add another return and so on. As an example, both these things would make doing a block of Notes on a drawing much easier – it is nice if the word "Notes" can stand out in bold or underlined; and often notes are copied and pasted from one drawing to another - but the space for them is not always the same, or you want to make a small alteration which changes the line length . Add styling. Pretty unimportant I guess, but it's common to have "UPPERCASE – lowercase – Title" styles which can make labelling quicker (using Title) – or if you've typed a lot of stuff with the Caps Lock down by mistake! (use lowercase to fix the bulk of it). Add line spacing. Again not very important, but sometimes it is nice to be able to change line spacing (by points rather than just single or double). When you flip an elliptical arc it changes to a polygon – could it stay as an ellipse? Circular arcs stay as arcs. Much the same happens with rounded rectangles – the corner radii change to polygons if you rotate or flip them about an axis – can they stay as simple radii. Splines. Could there be two types of spline - one as now where the spline passes through the nodes. And a second type where the nodes are controlling the shape of the spline but the spline doesn't necessarily pass through them. With the second type, it is really useful if the degree of tension from the nodes to the spline can be adjusted. It's also useful to be able to flip between the two sorts. One way to do this is by way of an Unsmooth command, which basically turns the spline into a polygon – then two smooth commands – an ordinary smooth (spline attached to nodes) and a spline smooth (spline passes through nodes). The corollary of this of course is that you can turn a polygon into a spline ... Another way is to simply be able to switch smoothing modes without passing through he Unsmooth function – in which case you can't turn a polygon into a spline! Regular polygons. Could these be more controllable. So with the shift key down a flat was vertical or horizontal (and for even sided ones, two flats). And could they be adjusted in the Edit pallet by Width across Flats – and Width across Points. Or just dx and dy for the whole polygon, which would deal better with odd-sided ones. An obvious use of regular polygons (hexagons anyway) is to draw nuts and bolts and it's not so easy at the moment. I realize that this will change the nature of a regular polygon to a multi-sided object like a square or rectangle. Templates. I save a set of drawings pre-formatted how I want them for some of my most common set-ups. For me that is Page setup, Scale, Layers and Layer Layouts, where the tool pallets sit on the drawings and so on. For example I commonly use A3, landscape, no margins, two layers (Plan at 1:10 and Detail at 1:2), drawing size one page (Height *1, Width *1), two Layer layouts (Plan and Detail), text size, tool windows all sat over to the right and so on. A design may well have over 100 such drawings, so it's nice not to have to keep setting it all up each time. And I have quite a few other similar setups for other scales, paper sizes and so on. But my setups are scattered all over and often duplicated! It would be better to be able to make a set-up and save it as a Template – then they'd all be in the same place and easily accessible. I guess the File menu would gain an "Open template" option and the File >> Save as... would gain a "Template" option. That's a pretty extensive collection of arrows. And, more importantly, I can see how they will be in demand for more fluid design disciplines. I think that my step to go to V5.00 directly with a big update was too ambitious according with the time that I have (I have a real job to live...) and because I have to update iPocket Draw almost simultaneously. - Improved drawing of arrows, if possible with polygon instead of lines only. Perhaps that it would be a good thing to release RealCADD V4.90 like this, as beta version in a first time to see if all is good. It sounds like a pretty big update as it is, with a lot of new stuff to absorb, which is exciting. For my ten cents worth, I would release it as a beta version for testing so any bugs can get ironed out and so on, before they get incorporated in a new version. I don't think that detracts from a new V. 5 – just helps to make it as smooth as possible. I like the new colour system and the primary colours on the main palette, with the full spectrum available - much better than the previous system I think. And I really like all the new arrows, textures and the improved hatching system – all great. And I specially like being able to turn a line into a spline and choose the number of segments which I find I am using surprisingly often. And one snag I seem to lose all arrows on drawings created in earlier versions. They are still there if I open with 4.80 - but all disappear if I open with 4.90. 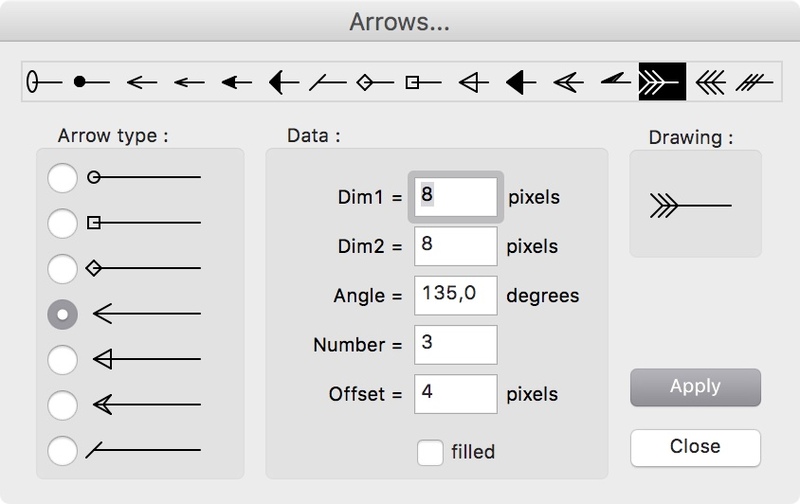 I have the same arrow (15º – 6 pixels) in 4.90 as I was using previously. New Mouse Position is great. New alphabetical Library is really great! Don't know if I've missed anything new ...? ?